From a delicious sea food stew to a traditional fried pastry at the market, Rio de janeiro offers the hungry traveller plenty of unique culinary experiences. Don’t go home without trying at least one of these traditional Brazilian foods. 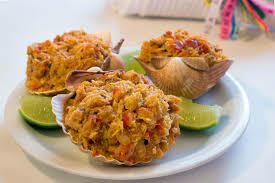 Acarajé is traditionally encountered in Brazil’s northeastern state of Bahia, especially in the city of Salvador, often as street food, and is also found in many countries in West Africa. 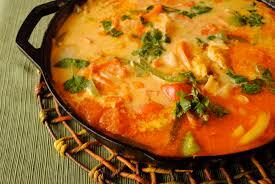 The dish is a recipe taken to Brazil by the slaves from the West African coast. It is a dish made from peeled beans formed into a ball and then deep-fried in dendê (palm oil). 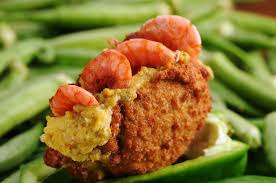 It is served split in half and stuffed with vatapá and caruru – spicy pastes made from shrimp, ground cashews, palmoil and other ingredients. A vegetarian version is typically served with hot peppers and tomatoes. -General Osório Square – Sunday Hippie Market from 7AM till 7PM. Ask for the “baiana” stand. Also a great handcraft market where you can buy arts straight from the artists. 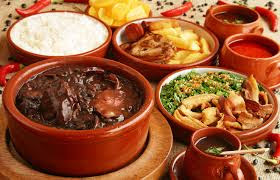 According to the legend, the origins of Brazil’s national dish, feijoada, stem from the country’s history with slavery. Slaves would supposedly craft this hearty dish out of black beans and pork leftovers given to them from their households. These leftovers included pig feet, ears, tail, and other portions seen as unfit for the master and his family. However, this theory has recently been contested and considered more of a modern advertising technique for the dish rather than a basis for its origins. But really, you can try it in many other restaurants. Saturday is a typical feijoada day. Enjoy it with a caipirinha! Casquinha de siri or stuffed crab shells is a Brazilian starter made with sautéed crab meat, coconut milk, palm oil, tomatoes, bell pepers and parmezan cheese. It’s origin is not known but countries as France, Spain and Portugal also use the shells at certain dishes. Where to eat: Most Brazilian restaurants will serve casquinha de siri. But if you want to have it the true Brazilian way, go to one of the ecological beaches Prainha or Abricó (one hour drive from Copacabana) and enjoy your day at the beach restaurants! 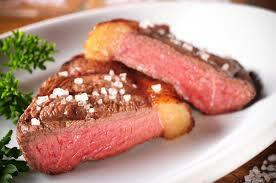 Picanha is a special and idolized cut of meat. A brazilian BBQ could NOT go without one. It is very much like an entrecôte cut. If you love meat like I do, you can’t miss out on the brazilian rodízios. The brazilian rodízio steak houses have a large buffet with innumerable variety of salads and starters and they will serve the sizzling grilled meat and fish at your table. Bets place to try a picanha! Moqueca is a Brazilian recipe based on salt water fish stew in coconut milk, tomatoes, onions, garlic, coriander and some palm oil (dendê). Slowly cooked in a terra cota casserole optionally serve with prawns and choosing by preference a mix of boneless fish species like small shark, sword fish, etc. Originally from the states of Bahia in the Northeast, also coming from Espírito Santo in the Southeast of Brazil; nowadays, this dish is found in two different variants: moqueca baiana from Bahia and moqueca capixaba from Espirito Santo. This place is a cultural market where you will find restaurants and handcrafts from the Northeast of Brazil. Life music in the evening and weekends. 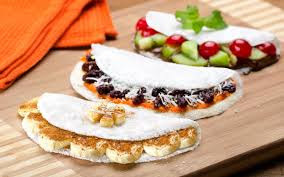 Pastel is very traditional in Brazil as a street food with very thin fried pastry which can be filled with cheese, minced meat, shrimp, cod fish, crab and many more. It goes perfectly with the caldo de cana, sugarcane juice. Where to go: Most markets will have a pastel and caldo de cana stand. There is a market in the Praça Nossa Senhora da Paz every Friday from 7AM till 1PM. Be a local and try out the tropical fruits too! One of my favorites, the tapioca is a starch extracted from cassava root. This species is native to the North region of Brazil, but spread throughout the South American continent. Tapioca is used for different types of meals. It is moistened, strained through a sieve to become a coarse flour, then sprinkled onto a hot griddle or pan, where the heat makes the starchy grains fuse into a flatbread which resembles a grainy pancake. Then it may be buttered and eaten as a toast (its most common use as a breakfast dish), or it may be filled or topped with either salty or sweet fillings, which define the kind of meal the tapioca is used for: breakfast/dinner, or dessert. Choices for fillings range from butter, cheese, ham, bacon, various kinds of meat, chocolate, fruits such as ground coconut, condensed milk, chocolate with sliced pieces of banana or strawberry, among others. This kind of tapioca dish is usually served warm. Where to go: Basically, if you pay attention, you will see them in many corner as it also a street food. Also try the churros! Pão de Queijo is a small, baked, cheese roll, a popular snack and breakfast food in Brazil. 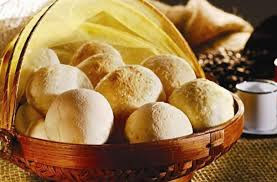 Pão de queijo originated from African slaves like many other Brazilian foods. Slaves would soak and peel the cassava root and make bread rolls from it. At this time, there was no cheese in the rolls. 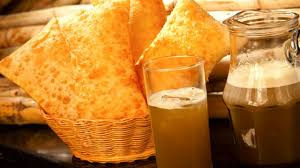 At the end of the 19th century, more ingredients became available to the Afro-Brazilian community such as milk and cheese. 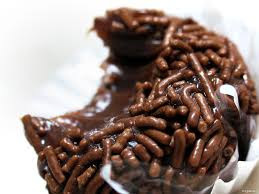 The brigadeiro is a chocolate truffels made of condensed milk and it makes up a big part of the Brazilian culture. It is a democratic dessert that many people can enjoy. It can be made in the north or the south, eaten by rich or by poor, men or women, children or adults. The brigadeiro is present in innumerable occasions: from birthday parties for children to more luxurious parties. It is often more anticipated than the traditional birthday cake. The brigadeiro is offered in more elaborate forms where the preparation includes high quality ingredients, giving it a higher status of a gourmet dessert. Where to go: Any bakery or snack bar will sell them. The fruit, commonly known as açaí berry, is a small, round, black-purple drupe about 25 mm in circumference, similar in appearance to a grape, but smaller and with less pulp. 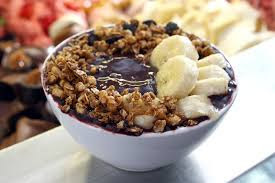 In the general consumer market, açaí is sold as frozen pulp, juice, or an ingredient in various products from beverages, including grain alcohol, smoothies, foods, cosmetics and supplements. In Brazil, it is commonly eaten as Açaí na Tijela. The super fruit can be can be blend with bananas and strawberries and top with granola and honey. Perfect for before sports. Where to go: Any snack bar! I¡¦ve recently started a website, the information you provide on this site has helped me tremendously. Thanks for all of your time & work. I intended to compose you a very small word to help thank you so much as before on your fantastic tips you’ve discussed here. This has been certainly shockingly open-handed with you to offer openly all a number of people could have supplied as an e-book in making some bucks for their own end, certainly now that you could have done it if you desired. Those guidelines in addition served to be the fantastic way to be certain that some people have the same keenness similar to my own to figure out significantly more on the subject of this matter. I believe there are several more fun sessions in the future for many who view your blog. I simply had to thank you so much once more. I am not sure the things I would’ve done without the type of opinions documented by you relating to this industry. It was actually a very difficult condition in my view, however , seeing the very expert technique you resolved the issue took me to leap for happiness. Now i’m grateful for your help and in addition wish you are aware of a powerful job that you are accomplishing training others through your webpage. I know that you haven’t met all of us. Excellent read, I just passed this onto a friend who was doing a little research on that. And he just bought me lunch as I found it for him smile So let me rephrase that: Thanks for lunch! It¡¦s really a great and helpful piece of info. I am glad that you shared this helpful info with us. Please stay us up to date like this. Thank you for sharing.